One of the key areas of injury on construction sites across the country is through moving vehicles and plant on site. As this is an area identified by all sites, many contractors already have control measures in place to help combat this. Segregated walk ways and banks men only, sounders and flashing beacons are all part of the solutions that help combat this. The problem is amplified further on sites such as ours with basement space where forklifts are constantly used within to store and move materials around site for distribution up the multiple blocks. However with all this in place the risk still exists and people still continue to get hurt annually. We have been exploring ways to further eliminate this problem in the construction site environment. All forklifts operating on our project are required to have a revering sounder, flashing beacon, banks man procedures in place and a schedule of common lifts to ensure all loads are lifted correctly. Having spoken to numerous suppliers across the nation who supply forklifts for various industries we have come across a newly introduced solution that will help combat this problem. 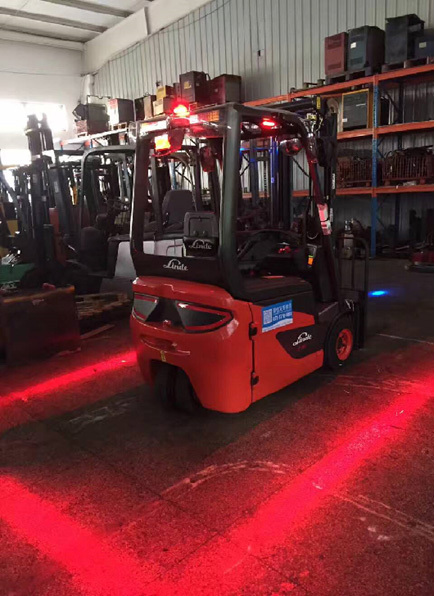 Forklift Safety Zone lighting is a post fix product which can be fixed to any forklift. This will emit a red lighting zone around the forklift at all times fixed to any distance you like from 0.5 meters to 3 meters away from the forklift. This is fixed in place with all movements from the forklift. This will ensure the safety zone around the forklift is clearly illuminated for everybody to stay away from.